Running old-skool windows on OCI supported by Oracle! Doing some basic research, I was already surprised that officially Oracle supports Microsoft Windows all the way back to Windows 2008 R2. For Windows 2008 and above you can even use the official Oracle OCI para-virtualized drivers to get optimum speed from your VMs. Even more surprising was that Windows 2003 and any older windows is officially NOT NOT supported!! Yes you read that correctly, I am NOT saying it is NOT supported, but Oracle is even willing to provide “best effort support” on anything you bring yourself. So let’s give this a try. I installed a windows 2003 sp1 – 64bit windows machine on my local VMware ESXi box, did an export, uploaded it to OCI and created a custom image from it…. FAILED… I get no response from my VM on OCI. I did some digging and testing. 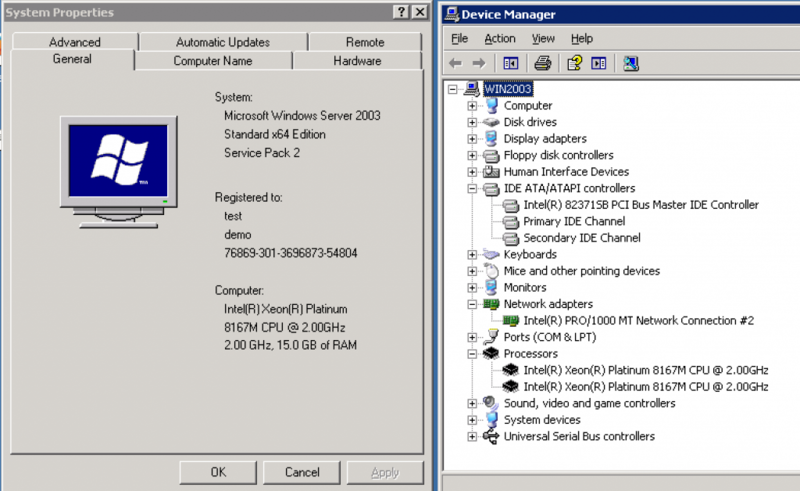 I tried installing the para-virtualized drivers into Windows 2003 and got recently far with that after upgrading the windows installer modules, but this also failed. So the focus had to be on running Windows 2003 in emulated mode. In this mode the VM on OCI gets an Intel Pro 1000 network adapter, which should be fine for my Windows VM and it boots off an IDE harddisk (emulated). Which is a bit different, compared to my VMware environment. In the Oracle Documentation online, I did find some details on how to prepare a Windows 2008 image. Thank god there is google 🙂 After some more searching and the greatness that nothing really disappears from the internet, I found some very old registry hacks / dark voodoo , that should help migrate VMs on github. So I gave this list of registry hacks a try… exported, uploaded and create a new custom image…. We got life! Amazingly enough, my Windows 2003 server was running! I upgraded it nicely to SP2, did multiple reboots, just to make sure this really really was working and it did!